Bar and Nightclub: Give Email Marketing a Shot! 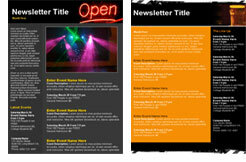 Email newsletters help bars & nightclubs pour round after round. Promote your nights better with video and pictures to your email list. Tweet and Share your e-blasts directly to Facebook and Twitter. Grow your email list quickly with online sign up boxes. Learn about new marketing trends with our Bar & Nightclub marketing blog. Email Newsletter Software easily and quickly produces powerful newsletters, e-blasts and special offers. Email Marketing Manual for Bars & Nightclubs. Download the free PDF or read it directly from our website today!